It’s the most exciting night of the year in their town, as Olivia and friends prepare for the annual Hallowe’en celebration. When the teens set off for the party, Olivia’s mother asks them not to take the rural back lane to the old southern mansion where the event is to be held. Ignoring her mother’s request, they find themselves crashing into trees in the near darkness before reaching the rear grounds of the mansion. 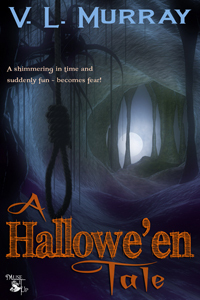 When a gallows suddenly appears out of nowhere, the teens realize they may be about to witness a hanging. Could this be the ghost of Olivia’s ancestor? The one executed for witchcraft? Olivia’s stubborn curiosity overwhelms her friends’ fear, and she leads them into an adventure the teens could never have foreseen when they encounter a glimpse into history. “Mom, what was our ancestor’s name? You know, the one who was the butler over at the Desjardin house in the 1700’s? Mom? Mom!” Olivia was trying to tell a story to her friends, the story of her family’s link to the plantation house where they would be going to the big Hallowe’en party that night. Once again, her mother failed to answer. Her mother, Cantare, was rocking slowly back and forth in her favorite chair, staring out at the shadowy fields that stretched for miles behind her family home. She was humming softly to herself. It was a strange little tune Olivia had also heard her grandmother sing. It occurred to her, for just a second, she could probably hum the whole thing herself, if she tried. Her mother spoke slowly, “Stillwater…and we don’t know if she was a witch. It was never proven.” Cantare continued to rock in her chair; the humming began again. “Well, they burned her didn’t they?” Olivia was annoyed that her story had probably lost all of its impact by now and she might even have to begin telling it again. The rocker stopped and her mother looked up, her face a mask of sorrow. Olivia charged back to the front room where her friends were waiting for the rest of the story and proceeded to carry on with her sordid tale of the past. The group emerged about ten minutes later, all seeming to laugh and talk at once. They were excited at the prospect of attending the party being thrown at the mansion on the edge of town. Descendants of the original owners still lived there and their daughter was in the teenagers’ class at school. She, Evangeline, had invited them all to come. Next to Christmas, this was the biggest event of the year in their town. Olivia’s mother was also invited, as she had been every year, but once again, left the invitation sitting on the kitchen table, from where it would eventually be retrieved and then dropped in the trash. Olivia could never understand why her mother wouldn’t attend. “You’re sure you’re not coming?” Olivia asked without emotion. The passionate pleading had ended when her mother finally agreed to let her go with her friends. Olivia mumbled an okay, kissed her mom’s cheek and then practically leapt from the porch, taking off at a run toward her friends who were now waiting on the street. Cantare began to hum again as the chair slowly creaked. A few minutes passed and then, from the corner of her eye, she saw shadows move across the far side of the neighbour’s back lawn. The giggles were almost imperceptible as the teens darted from tree to tree. Finally, she heard the slow creaking whine of the wrought iron gate at the end of the yard and then a slight click as it returned to its original position. Laughter erupted, and the thumps and shuffles of running feet echoed in the night as the four friends bolted down the old lane. Cantare increased her rocker’s speed and began to hum a little louder. This is a scary little “must read.” The suspenseful events and surprises will grasp your attention and unnerve your inner fears and fantasies. Ms. Murray’s highly creative imagination has brought her characters, both young and old, together with a suspense that keeps you on the edge and awaiting the climax. Look out V. C. Andrews! If you’d like a quick and satisfying read to get your blood flowing and your brain cells hopping, this is the story for you. Ms. Murray not only provides her readers with thrills galore in this compact and well-crafted tale, but she does so in the context of a thought-provoking narrative that contains far more than meets the eye. We can only hope that Ms. Murray soon digs into her fertile imagination to uncover another literary gem with which to beguile us. Highly Recommended!! Just finished reading this story and loved it!